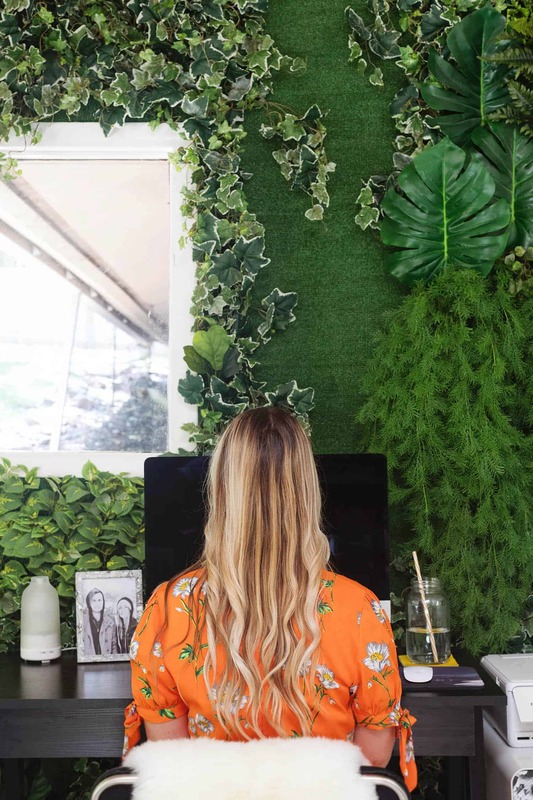 I am so excited to share the office makeover that we did for our friend Allison at her new shop, Apple & Oak in Nashville. 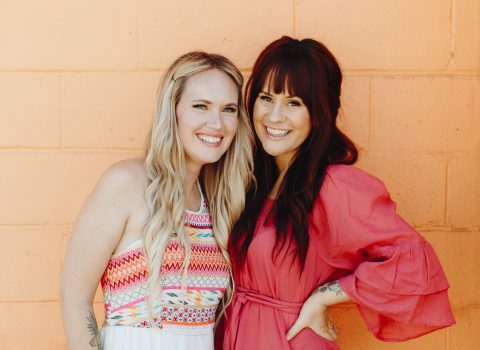 We met while we were working on Kacey’s dining room and she has become one of my best friends. 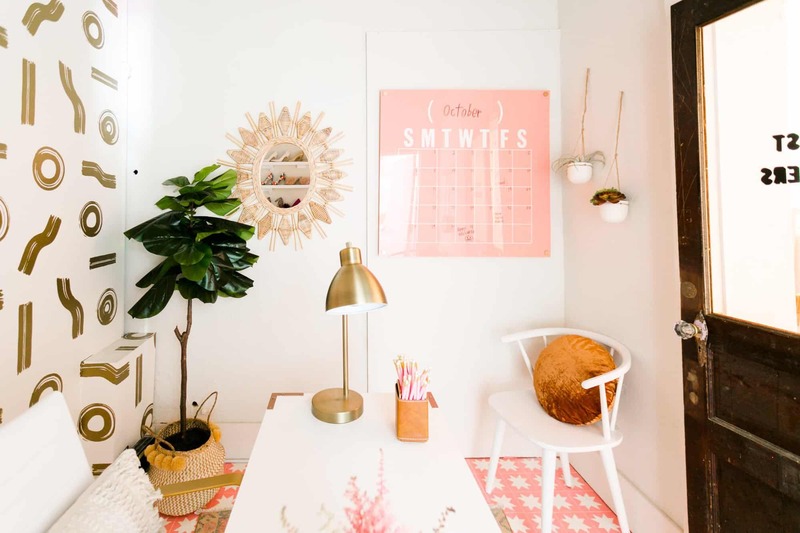 This past summer, as she was renovating her new location, I volunteered to help her design her office because I was in between projects and honestly, I just love being busy! 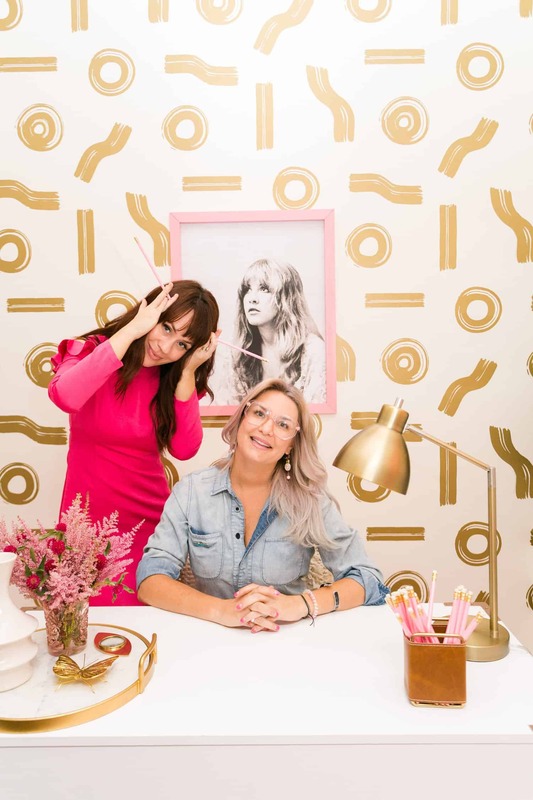 She told me that her dream office would be themed “’70s Barbie” and I knew it was going to be fun!!!!! The before was pretty crazy. The first time I walked through it, it was a dressing room from a shop that was previously renting the building. 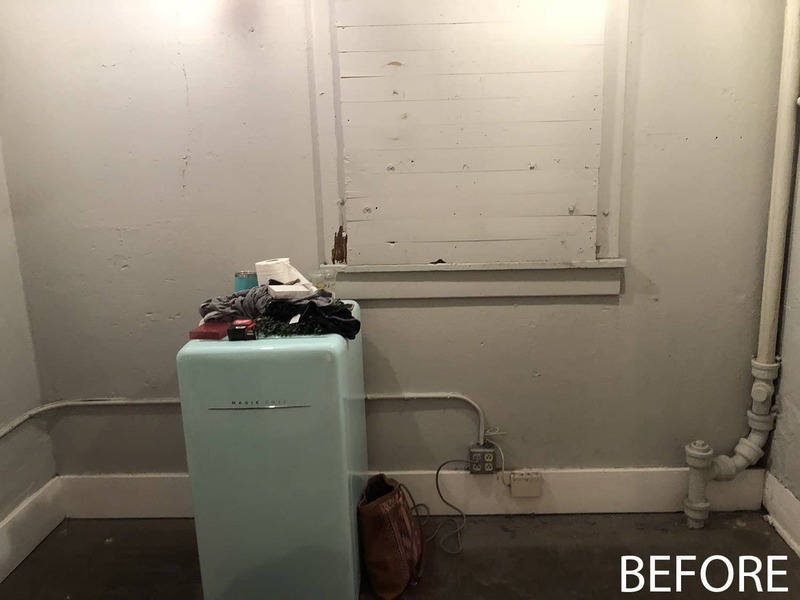 It’s basically a large closet—concrete floors, patched together walls with a LOT of pipes, and very, very sad lighting. 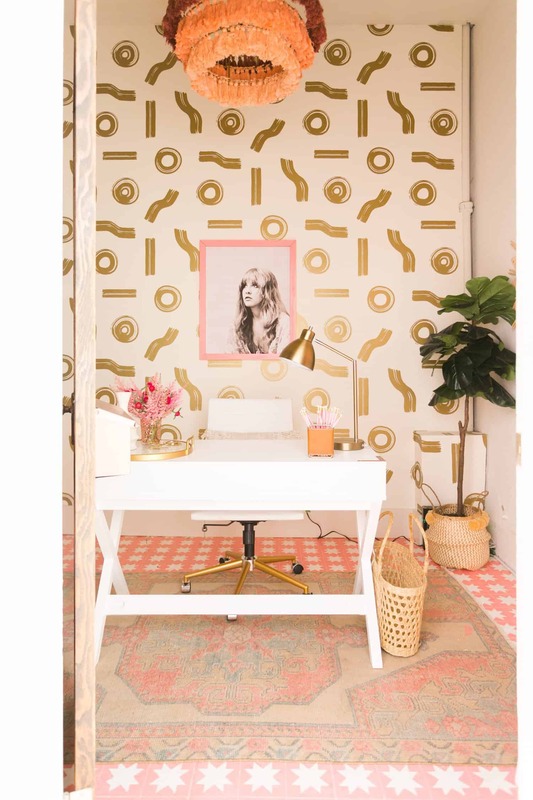 We got right to work designing and had so much fun DIY-ing a ’70s Barbie-themed office for Allison. I love love love what she did with the door (and this view) because you can see all the patterns at once! 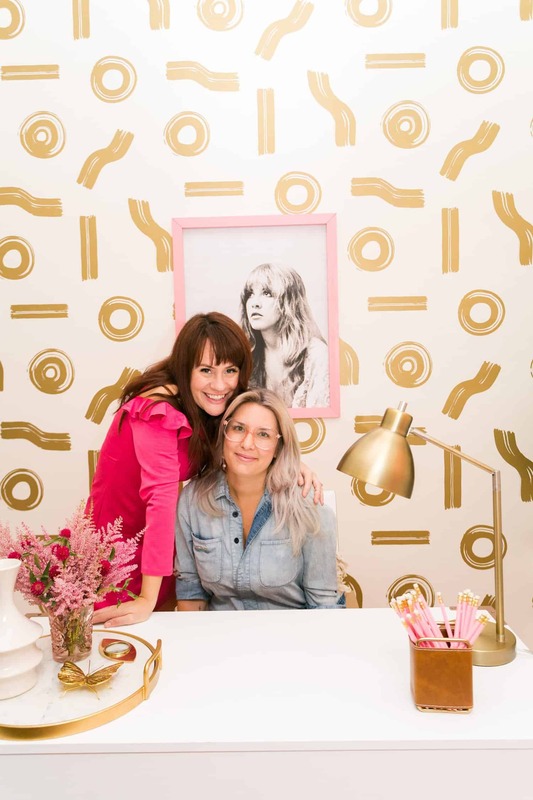 She hired I Saw the Sign in Nashville to gold leaf “maximalist headquarters” on the door— it’s so pretty and obviously the perfect mantra for Allison’s aesthetic. First, let’s talk about the wallpaper. 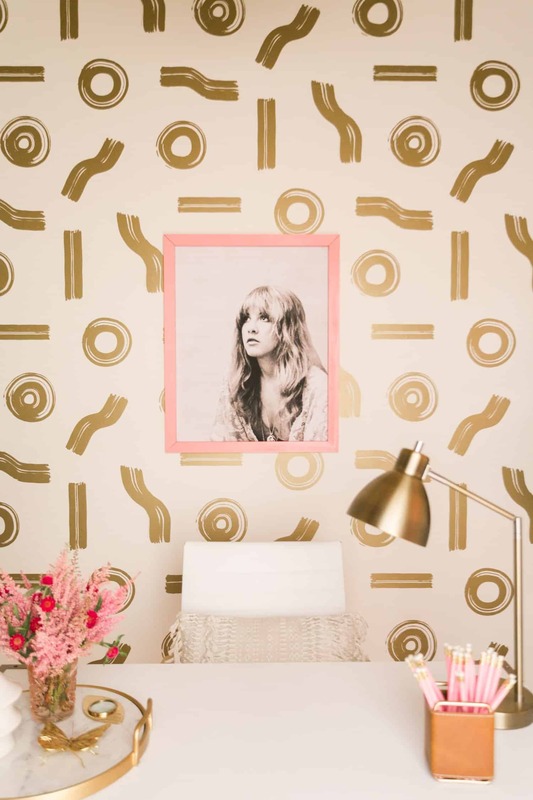 I LOVE this wallpaper and it has been on my “wallpaper bucket list” (huh, that’s not a thing?) for a few years. It’s incredible! It’s made by Juju Papers. Since it’s a large scale pattern, I wanted to use it on just one wall for maximum impact. It has a gold finish and is just so pleasing to my eyeballs. We found this printable Stevie poster on Etsy and had it printed at Office Depot. We made our own frame with this DIY, per usual. Adding the shoe shelves was a last minute idea—a little extra personality piece for Allison. I mean, you can’t have a ’70s Barbie office without a shoe shelf, can you? We added these white chairs from Wayfair to each side of the door, facing the desk. 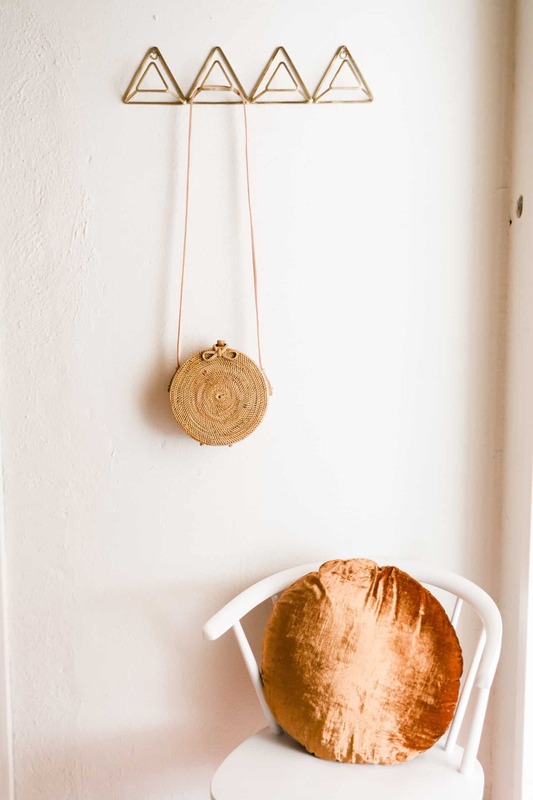 They’re the perfect size for the space and both functional and beautiful. I added these orange velvet pillows as well for maximum ’70s effect. 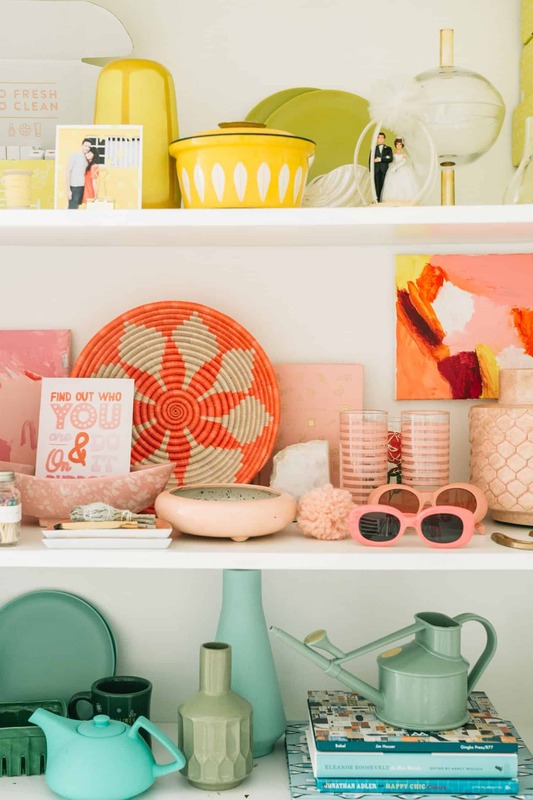 And, one of my favorite details is this pink lucite marker board. It was Allison’s biggest ask. She really wanted a giant marker board. I love how it’s beautiful AND functional (and PINK!). This floor was maybe the most time consuming DIY we have ever done in the history of ABM, but look how magical it is! For the rug, we used one from Allison’s shop, Apple & Oak. The desk was a super basic desk we picked up at Target that we DIYed the hell out of (paint, new hardware, etc.) until it felt mid-century glam! The chair is from Amazon and is THE perfect desk chair! It’s gold and white and beautiful (it comes in other colors too!). Here’s a link to the leather pencil holder. Picking out details is always my favorite part. 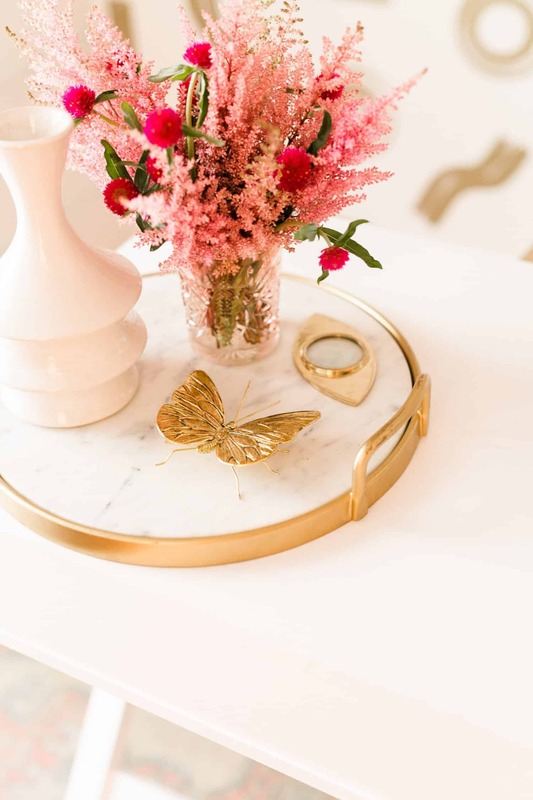 The butterfly, the eye, the mod vase, the tray … I love details! I had so much fun working on this project! I’m so happy for Allison and her new shop. If you ever come to Nashville, you’ll have to visit! 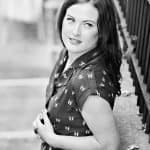 Credits/Author: Elsie Larson, Photography: Amber Ulmer. Project Assistant: Collin DuPree. Photos edited with A Color Story Desktop. I saw that lucite board and my heart skipped a beat! I knew if you didn’t offer a DIY, I would be googling for the next two hours instead of working… ha! I will patiently await that one! That wallpaper is SO fun! I also love that gold butterfly on the tray, adorable. 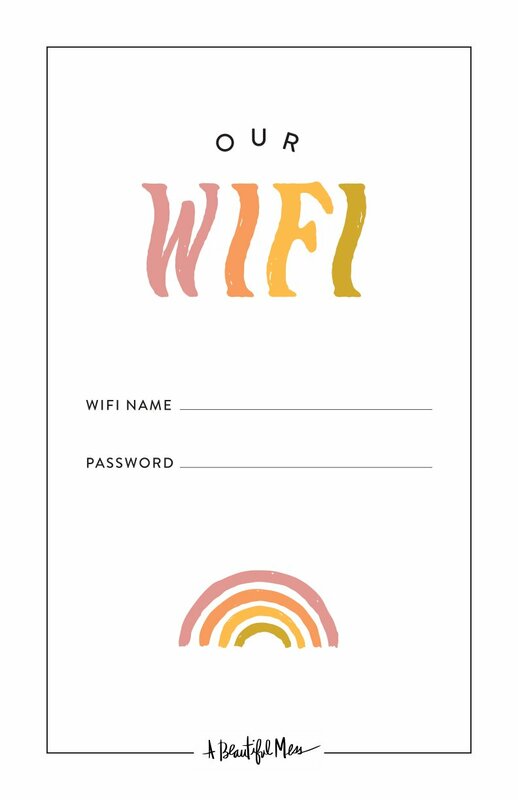 Love some of these DIY touches! Can’t wait for the calendar DIY! Is the triangle hook rail available somewhere or was that a vintage score?! The triangle hook was exactly why I came to the comments section too! Haha! Already did some sleuthing and found it on World Market’s website! I am so excited for all the DIYs this space will bring! What a beautiful office! 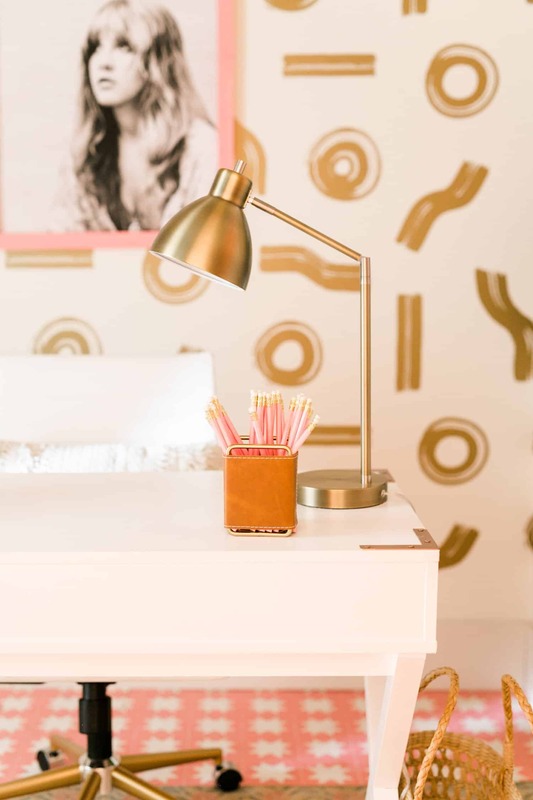 The office looks amazing, I’m so in love with all the gold details and the wallpaper! And the shoe rack is so cool! I am so in love with this space! I want this to be a room in my house! This might sound weird, but I’d love to do something like this in my closet! I want a fun, feminine vibe like this! 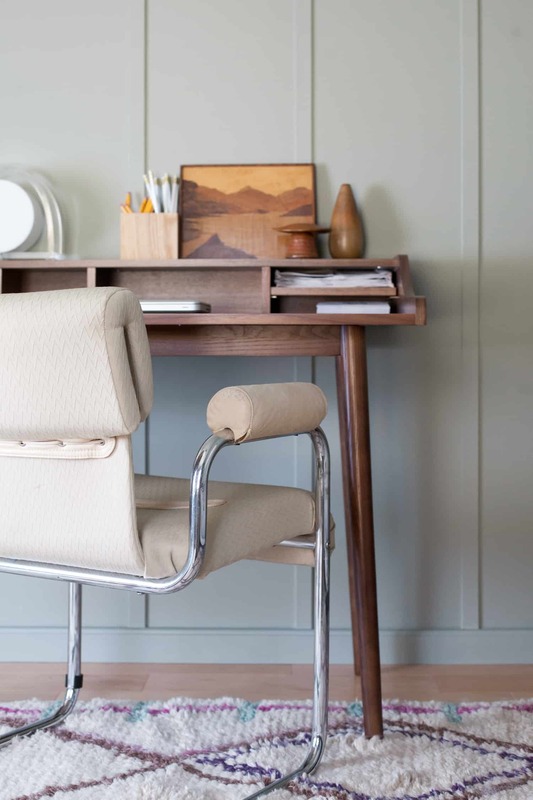 Hi, I am wondering what hardware you used for the desk (I’m 99.9% sure I have the same one and have been thinking of changing out the drawer pulls.) Thanks! Stevie 😍 and another amazing design! The quilter in me is obsessed with that floor! DIY painted you say? I can’t wait for that tutorial!!! Your office looks amazing! I’m dying over all the details! I loooooove office/studio tours!! :Thank you for sharing another one. 😀 What a cool theme, and also WOW THAT FLOOR! What a fun and beautiful space. I would love to hear about the light fixture. Is it diy? I loooove studio/office tours!! Thank you for sharing this one. 😀 What a fun theme. The painted floor is really pretty, and something I would absolutely love to try if I had a suitable floor for it. Hi! Do you know where she got her cool eyeglasses? I absolutely love it, what an amazing difference! Your hand-painted floor is unbelievable, but yeah, I can imagine it was time-consuming! I really like the juxtaposition of the floor and the rug. Job very well done! So so cute!! Great job Elsie! Amazing colors! This simple color scheme looks so beautiful! Beautiful! Where did the gold butterfly come from? 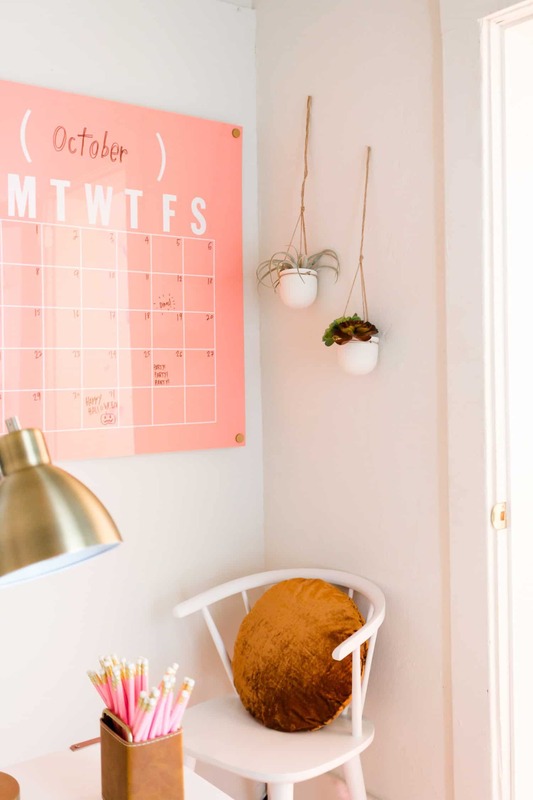 (Im)patiently waiting for that Lucite Calendar DIY! You CRUSHED it! 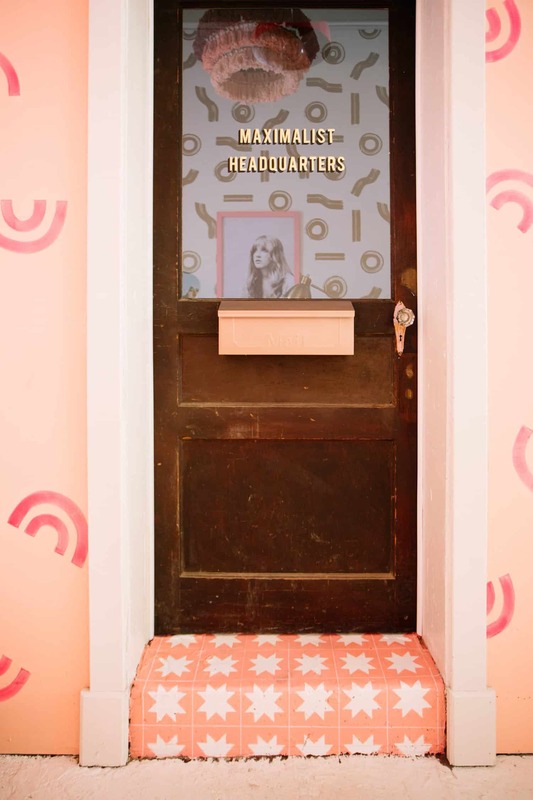 Looks like the perfect place to make some power moves… 70’s Barbie would be proud! It’s on the blog now 🙂 Just updated the link. 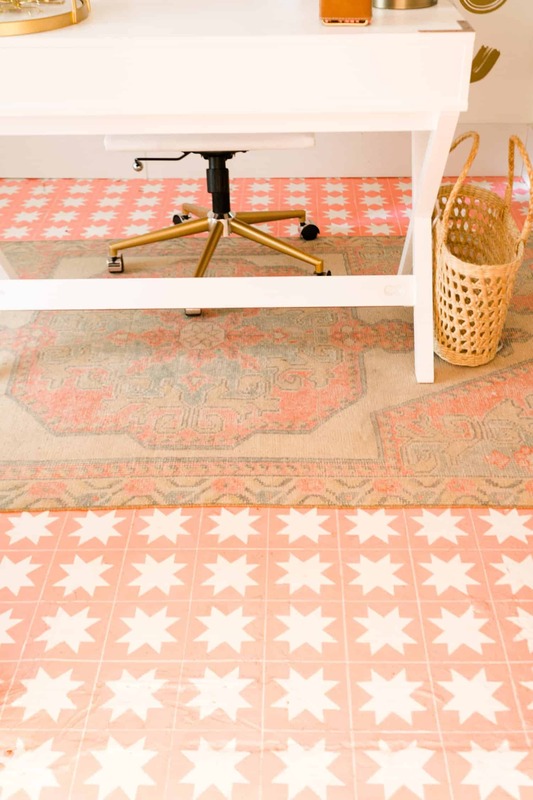 That floor is amazing….. can’t wait for the DIY post! !